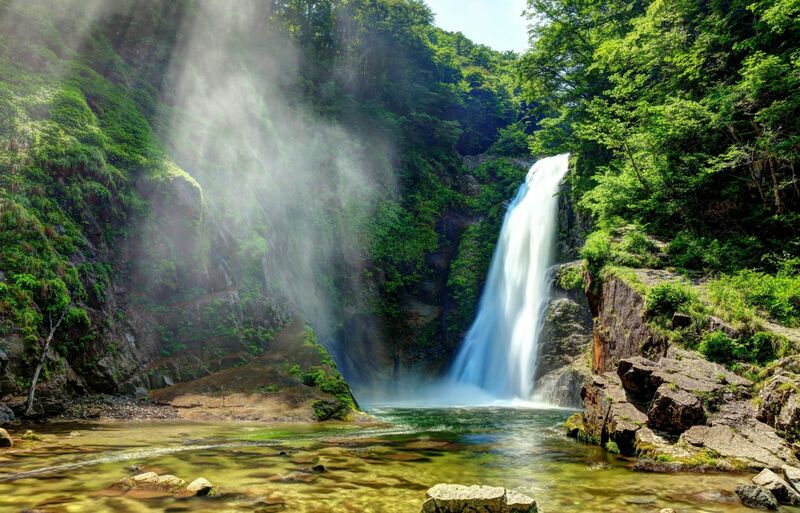 Miyagi Prefecture is full of delights for travelers eager to venture off the beaten path. In fact, one area, the Bay of Matsushima, has been ranked one of Japan’s Top Three Scenic Spots. Yet its hinterland regions are also full of hidden gems. We embarked on a one-night, two-day adventure to experience Miyagi’s inland cities of Osaki and Akiu. The Tohoku Shinkansen Hayate express train whisked us out of Tokyo and up to Furukawa Station in a mere 1 hour and 55 minutes. We then changed to a local train on the JR Riku East Line and rode out for 20 minutes to a place of very historical significance in Osaki City: the Historic Yubikan (旧有備館) at the base of Iwadeyama. Disembarking at JR Yubikan Station, we merely had to cross the road to enter the Historic Yubikan, which was constructed in the Edo Period (1603-1868) as a retreat for the second-generation head of the Iwadeyama Date family, Munetoshi. Later, it was used as a school for samurai. Its wooden structure suffered some damage during the Great East Japan Earthquake in 2011, but was painstakingly restored and reinforced with iron supports. A large garden surrounds the building, complete with a still pond and several small islands. The serene water quickly transformed into a teeming mass of frenetic carp when they saw us approaching the pond’s bank. Fish food is available for a small fee and we enjoyed tossing the food out to their gaping mouths—the ever-hungry carp never pass up a chance for treats! Exiting the Historic Yubikan, we walked for about 15 minutes to the Take Kogeikan (竹工芸館). This facility offers a variety of workshops for arts and crafts, but what we came here for was a more unusual experience: the opportunity to try on samurai armor which is called yoroi in Japanese (甲冑試着体験). Once I walked in and informed the staff which type of yoroi armor I wanted to try on, the staff took me upstairs to a dressing area. For the most part, dressing simply involved wearing some special Japanese garments overtop my Western clothing, so the process went pretty quickly. Next, the staff and I headed back downstairs and a team of two set about fastening the various pieces of the yoroi – first the parts on each leg, then the chest portion, then the arm pieces, and finally the helmet. Once fully dressed, they tucked some Japanese swords (replicas, of course!) into the waistband and my transformation into The Last Samurai was complete. I had always wondered what it felt like to wear such armor – Would it be weighty? Would it be hard to move around? Surprisingly the armor was not that heavy – perhaps 15 kilograms or so, though I’ve heard that the real armor and swords make for a total weight of about 25 kilograms. It was also much easier to move around than I expected – a far cry from the heavy metals suits of armor worn by Europe’s knights in the Middle Ages. This is because Japanese samurai were largely fighting on foot, rather than horseback (though some rode as well) and they needed to be nimble and highly mobile. By now it was time for lunch and we opted to visit a unique spot in Osaki City known as Kamuro. Here, old storehouses have been turned into a lovely little market space that includes gift shops and restaurants. We went over to eat at a well-known local shop in the complex called Iroha. I was very impressed with the voluminous yet tasty half-pork cutlet and half-ramen set for only ¥920 (about US$8). Not only was the food delicious, but the restaurant ambience was nice as well with both tables and tatami seating surrounded by Japanese antique furniture. All too soon it was time to leave Osaki and head back to Furukawa Station and then on to the recently remodeled Sendai Station via shinkansen. Our next destination was the hot spring town of Akiu, and while there is bus service to Akiu from Sendai, having a car is certainly more convenient. We rented a car at Sendai Station for the approximately 40-minute drive out to Akiu. When people think of wine-producing regions in Japan, places like Yamanashi Prefecture and even Nagano usually come to mind. Consequently, I was surprised to learn that a small winery called Akiu Winery (仙台秋保醸造所) opened up in Akiu just a few years ago. Given that it’s the only winery in all of Miyagi Prefecture, we made this our first stop when we reached Akiu. We spoke to the CEO, Chikafusa Mori, who explained that given his winery’s recent beginning most of the wine is made from grapes grown elsewhere in Japan. The vineyards are developing though and Mori thinks it won’t be long before he can use his own grape varieties. Nevertheless, the winery is a lovely spot to do wine tasting and we couldn’t pass up the chance to try the wine as well as their outstanding award-winning apple cider (available in both brut and sweet varieties). After a long day of traveling, we turned in for the night at the onsen ryokan (hot spring inn) of Ryokusuitei (緑水亭). Set atop a hill in Akiu, the facility offers outstanding views of the valley below. After checking in at the front, we were surprised to see an open cask of local sake in the lobby, free for guests to sample before dinner. Dinner was a fabulous kaiseki-style (course meal) affair, and we were excited to try a variety of dishes with gourmet specialties including sashimi, Japanese wagyu beef and crab. When Japanese come out to a hot spring resort, they are primarily focused on two things: eating well and spending quality time in the hot springs. Having done the former, it was time to visit the hot spring before retiring to our Japanese-style tatami rooms for the night. The indoor hot spring area was spacious and featured several different baths and a sauna but it was the outdoor bath, known as the rotemburo in Japanese, that really made an impression. While some hot springs have a rotemburo just outside the indoor baths, the one here at Ryokusuitei involved heading outside and descending several short flights of stairs to a location down below tucked out of sight. As I made my way through around a bend, the chilly air making me look forward to the hot bath all the more, I was struck by the sight of several flaming torches. The rotemburo came into view and it was nestled amidst rocks—a style known as iwaburo. The comforting warm water, bright gas torches, and gorgeous natural scenery of rocks, trees and shrubs leaves an indelible impression and relaxes the body and mind simultaneously. and a beef curry with Sendai-gyu beef as well as a mix of Japanese and Western dishes.